The Peter and Joanne Brown Foundation Collection of Antique Banks Expected To Realize A Pretty Penny At Auction In January, 2017. Peter Brown, an avid Canadian collector of duck decoys, fine and First Nations art, historical books, and antique banks, will be selling his museum-quality bank collection through Morphy Auctions on January 14th, 2017 in a single collector’s sale. This event features over 500 remarkable examples of breathtaking mechanical and still banks, including some spectacular and one-of-a-kind examples featured in well recognized reference books and materials. All items from this sale are on display in Morphy’s Denver, PA auction gallery and available for preview now. 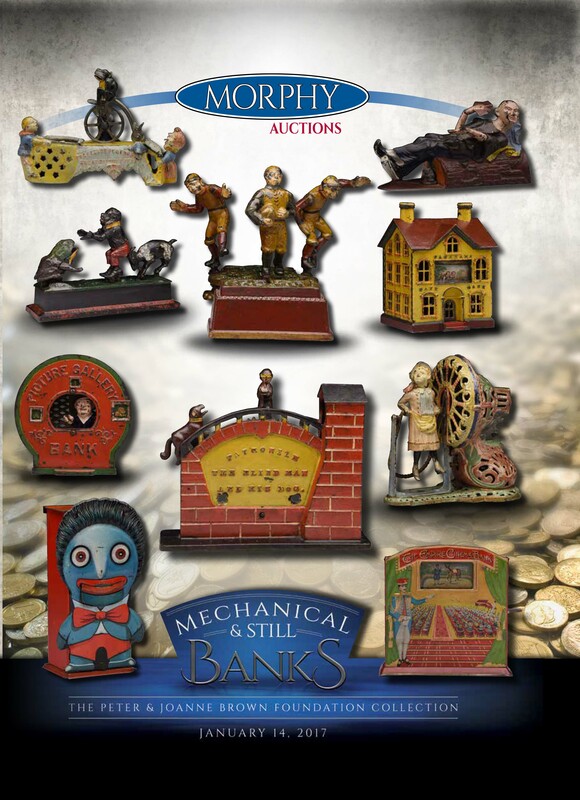 The Brown collection includes over 230 rare mechanical banks sure to have collectors moving and grooving! Examples featuring people deserve a standing ovation. It’s a perfect game with lot #163, a Kyser & Rex “Bowling” bank, estimated at $60,000-90,000. When a coin is inserted into this absolute rarity, the bowler leans forward and releases the ball, which then knocks over the pins and rings the bell. Things are in the black with lot #85, a Hall’s “Twin Bank” bank, estimated at $60,000-80,000. In this remarkable example, the one cited in Al Davidson’s Penny Lane: A History of Antique Mechanical Toy Banks, a coin appears to be deposited into a bank through a transfer between two well-dressed men. For collectors in the know, lot #250, a Charles A. Bailey “Chinaman In Boat” bank, walks on water. When a coin is placed on the figure’s tray, he flips over the tray to deposit the coin and then subsequently presents dinner… a well done rat! This visual feast is estimated at $25,000-45,000. And lot #340, a red table version of Kyser & Rex’s “Mikado” bank, is pure magic. When a coin is placed under the Mikado’s right hand and a crank is turned, the coin disappears from his right hand and reappears under his left one; once a second coin is deposited, the first one drops into the bank. This happy handful is estimated at $20,000-35,000. Mechanical banks in from the Brown collection featuring animal themes are also certain to drive collectors wild. Lot #428, a J. & E. Stevens “Bull and Bear” bank, is estimated at $20,000-30,000. Analogous to the stock markets here in the USA, when a coin is placed in the pendulum and the lever is pressed, the currency can fall to either the bull or the bear shaped figure seated on the base. And lot #249, an unmarked “Seek Him Frisk” bank, estimated at $40,000-60,000, is paws-atively fantastic. In this action packed example, when a coin is inserted into a tree stump on the right, a dog begins to chase a cat resting at the base of a tall tree on the left. Once the dog gets close to the cat, she quickly climbs up the side of the tree. The Brown collection offers more than a penny for your thoughts concerning its magnificent assembly of 120 still banks. Interest is building in lot #161, a 10” tall “Old South Church” bank with an impressive steeple, estimated at $8,000-12,000, and lot #254, an 8-1/4” long red and grey-green Ives Blakeslee & Williams “Palace” bank, estimated at $4,000-8,000. Lot #436, a Kenton “Mama Katzenjammer” bank, featuring a big blue Mama keeping a close hand on Hans and Fritz, is estimated at $8,000-12,000. When a coin is inserted into a slot in Mama’s back, her eyes roll up and down. And lot #447, an E.M. Roche Novelty Company “Piano” bank with provenance from the Edwin Mosler Collection, will strike a note with many collectors. This example, which features a music box which is activated by the drop of a coin is estimated at $2,000-6,000. Tin and vending examples are the third major category of banks represented in the Brown collection sale, with about 150 fine examples on offer. It’s off to the races with lot #429, a Berger and Medan Manufacturing Company “The Winner” bank. This barnburner of an example – from the Steckbeck Collection and previously sold by Morphy’s in 2007 – features a miniature, coin activated derby. This thoroughbred crosses the finish line with its $15,000-20,000 estimate. Three tin examples by German manufacturers give this grouping in the Brown collection an intriguing foreign accent. The first, lot #246, is a Saalheimer and Strauss “Golliwog” bank, originally filled with candy. This sweet treat, featured in Dan Morphy’s book, The Official Price Guide to Mechanical Banks, is estimated at $8,000-12,000. The second, lot #338, is an “Empire Cinema Bank.” It “stars” four photos which alternate every time a coin is inserted and a lever is pressed; it is estimated at $10,000-20,000. And the third, lot #432, is a Saalheimer and Strauss “Mickey Mouse” bank, the third of four variations manufactured. Here, Mickey “eats” coins on his tongue when his ear is pulled. This 7” tall example in excellent condition is estimated at $12,000-18,000. Doorstops, tin toys, and cast iron toys from the Brown collection – including lot #82, an Ives “Old Woman In A Shoe” wheeled toy estimated at $6,000-10,000 – round out this once in a lifetime sales event.